Mobile technology is transforming how businesses capture and use valuable information. At GoSpotCheck, they believe that great software not only helps people do their job better but it is also becoming table stakes for every employee, especially those in the field. 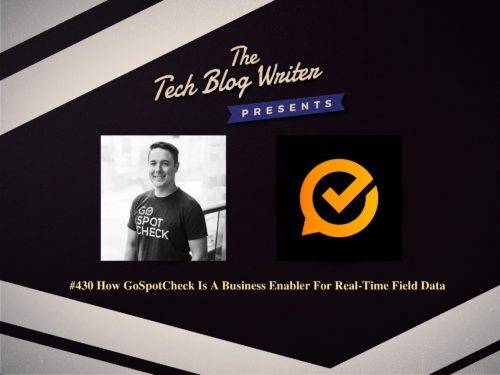 GoSpotCheck is a simple, integrated SaaS platform for companies with large field operations looking for real-time field data and improved execution from their field teams. Its data-driven technologies allow for efficiency in the field and advanced reporting that makes getting more product displayed easier. Working with companies like Under Armor, PepsiCo, Dannon and Anheuser-Busch, GoSpotCheck were seen maximizing performance in the field during the holiday season. The Denver-based startup has already secured $21.5 million in Series B1 funding, led by existing investors Insight Venture Partners and Point Nine Capital. GoSpotCheck has now raised $47.5 million dollars as the company pursues additional investments in its state-of-the-art mobile platform. I invited their CEO Matt Talbot onto the show to find out more about their future plans to use a $21.5M Series B1 funding round to further develop their leading field execution management platform, leveraging artificial intelligence and machine learning to create the most robust product offering in the business. Matt focuses on shaping the company strategy, financing and building the team. Before he started GoSpotCheck, he worked in corporate finance at Johnson & Johnson. As an entrepreneur, he is also interested in mobile and the ways that technology can change the way we interact with the world. His specialties include starting up, creating momentum, building teams, branding and identity, business model development.